Multimode fiber optic patch cables come in 62.5 micron and 50 micron diameters for the actual glass core. With the cladding layer, they are both 125 micron, and with the buffer layer they are 250nm. You should ensure that you purchase patch cables that match the core of any other fibers to which you will be connecting. 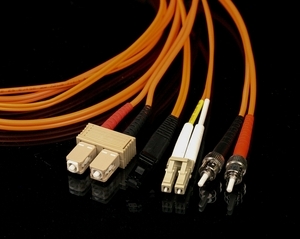 The PVC jacket of the multimode fiber is normally orange (although we can make them in other colors) and is 3.0mm in diameter for ST, SC, and FC connectors, but 2.0mm if the cable has an LC or MTRJ connector. We can also make these cables with a plenum jacket or a LSZH jacket, if required.